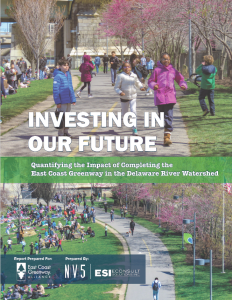 Quantifying the Impact of Completing the East Coast Greenway in the Delaware River Watershed | Econsult Solutions, Inc.
ESI, in partnership with NV5, was retained by the East Coast Greenway Alliance to produce a report assessing the impact of completing the East Coast Greenway in the Delaware River Watershed. The East Coast Greenway is developing into one of the nation’s longest continuous biking and walking paths, connecting 15 states and 450 communities from Key West, Florida, to Calais, Maine. The report looks at the impact of the East Coast Greenway within the Delaware River Watershed specifically, not the entire regional trail network. Many Delaware River Watershed communities and open spaces are linked through the East Coast Greenway. Its complete buildout will enable residents and visitors to walk, run, bike, or skate out their front doors for short or long treks. ESI Director Gina Lavery was also a guest on East Coast Greenway’s podcast on quantifying the impact of infrastructure and policies. Click here to listen.